Imagine being trapped inside your own body. No way to speak, to move, to swallow, to even breathe on your own. Think about living in that prison for years at a time - as a teenager, someone who'd only gotten through a handful of years to begin with. Now envision hundreds of people staring at you as you make the best of an unthinkable situation - and every single one of them wishing they had your guts. As thousands of fans flocked to Hampton's War Memorial Stadium last Saturday, they were there to do more than watch a baseball game. Sure, their Peninsula Pilots had been playing well recently in Coastal Plains League action, but there was much more to this game than RBIs and strikeouts. They were there to take part in a special tradition, one that's been a part of the team since 2002 - and no one knows how long it will continue. As her new son Kevin passed through his toddler years in the late 1990s, Brenda Eadie, like most first-time moms, knew that her little boy was perfect, and going to stay that way for a long, healthy life. That's why she wasn't too concerned when doctors told her that her main man's liver was enlarged. "We thought he just had a naturally enlarged liver," remembered the Williamsburg resident. "Everything else came back as normal, so we thought he'd grow into it." Unfortunately, the organ didn't stop growing. When Kevin was about three, doctors decided to run more tests on him. Then came Jan. 27, 1997 - a date that will forever hold a dark spot in Brenda's memory. Sitting in a doctor's office, she was told that Kevin had been diagnosed with Niemann-Pick Disease, Type C. The disorder, spurred by the body's inability to break down cholesterol, causes fat to build up on the liver, spleen, and brain, eventually causing neurological damage. There's no known cure or treatment for the sickness, which affects only about 500 people worldwide. Its victims rarely make it through their teenage years. Brenda couldn't - wouldn't - believe it. "It was quite devastating, like someone had shot a hole in my heart," she said. "For about six months, I cried about every single night. At the time, they told me there was no treatment, no cure. I said that if nothing was being done, I was going to be the one to change that." Right away, Brenda started spreading the word about her baby's plight. Letters went out. Fundraisers were organized. Walk-a-thons, car washes, dinners, and other events were held in Kevin's honor. Brenda got involved with the Ara Parseghian Medical Research Foundation, which helps raise money to fight the disease. It's named in honor of the longtime Notre Dame football coach, who lost three grandchildren to Niemann-Pick Type C (Kevin's face now beams from the Foundation's Web page). All the while, Kevin kept growing like any other child. He developed an affinity for Michael Bolton tunes. And, in typical American boy fashion, he found a way to the local little leagues. In the summer of 2000, his top two interests came together in the most special of ways. Kevin took a trip down to Raleigh, N.C. to check out the Bolton Bombers, his musical mentor's minor league squad. He got a chance to step out on the field with Bolton, himself an avid baseball fan, and beat him in a race around the horn! Just before the Pilots kicked off the 2002 season, Brenda sold tickets for a fundraiser for the team to raise money for the disease. Meanwhile, Pilots manager Hank Morgan and his father Henry, the team owner, played catch with Kevin. "We fell in love with the guy," Henry said. "He's the sweetest kid you're ever going to want to meet in your life. He asked to be the batboy, and I couldn't say no." For his first year as a Pilots batboy, Kevin was living the dream of millions of youngsters. Every time a player dropped a bat while speeding toward first, or handed it to him during a trotted walk or home run, Kevin was there, never missing a game. He brought balls to the umpires, usually getting a smile or handshake in return. More than just the smallest player on the field, the little fellow became the miniaturized face of an organization. "You have to be here to understand the effect that Kevin has on people, and on my players," Morgan said. "I've seen them come back to the dugout after a crummy at-bat, and they're ready to throw something or curse, but Kevin would look at them or say something to them, and it changed them completely." It showed - every year since the summer of 2002, the team has been holding an annual benefit game for Kevin, to raise money and awareness for his illness. During Kevin's second year, Morgan and his team noticed that Kevin wasn't moving as quickly as before. Sometimes he'd trip and fall on his way to home plate, and stumble while reaching for a bat. Though he'd never ask for help - following in baseball's eternal tradition of never showing weakness on the field - the same young, healthy Kevin wasn't showing up much anymore. His third year with the Pilots was more of the same: slower walking, more stumbling. He'd realized a dream - but now reality was taking over, and it was out for a heartbreaking victory. Still, Kevin's positivity continued to shine a bright visage across the Pilot family. In Sept. 2005, assistant coach Mike Moore laid in a hospital bed, recovering from triple-bypass surgery. The phone rang, and Moore picked it up. It was Kevin and Brenda, who were in Hawaii at the time, letting Moore know that even a country away, they were still with him. "They told me they were praying for me, and that they knew everything was going to be fine," Moore said. "It kind of minimized everything that I was going through, knowing that this young man has been battling this disease for years, and he was there for me. It's incredible that God has plans for everyone's life, and His plan for Kevin is to be one of strength." Perhaps on the inside - but by Kevin's fourth season of collecting bats for the team in 2006, everyone knew it would be his last; unable to get around without a walker, the players had to push him to and from home plate to do his job. "As we learned what it was and what it was going to do to him, it was pretty sad," said former Pilot Nick Erdman, now an assistant coach. "We tried to be his friend and tried to help him walk out to the umpire." But for all its well-meaning, friendship doesn't heal diseases, and Kevin's battle with his opponent was heading into the later innings. As the 2007 season rolled around, he was stuck in the stands. When the team held its annual day for him that summer, he was confined to a wheelchair, unable to take part in the event that showed how important he was to so many. During Kevin's sad season off the field, baseball legend Hank Aaron brought a little brightness with a personal letter in May 2007. "You've been a great batboy for the Pilots through the years, and I know that the players, coaches, and owner consider you a great 'teammate' of theirs and that you have helped them tremendously with your positive attitude," Aaron wrote. "Baseball has been a big part of your life, as well as mine... You have hit so many home runs just by smiling and persevering and proving the power of your will." In the opening months of the 2008 year, the Pilots knew when their special day would be - July 26 was marked as Kevin Eadie Day as soon as the schedule was released. They just didn't know if the guest of honor would make it back. His illness had stolen his ability to speak, or hardly move. He was put on oxygen, and made several trips to the hospital when carbon dioxide levels in his blood got too high. As the team warmed up to battle Petersburg, Richmond resident Jim Fryrear, who lived on the Peninsula for 15 years, was one of over 3,600 fans wondering if Kevin would make it. "Kevin needs our support," said Fryrear, himself a father of three. "We came from Richmond to see him. Words couldn't describe what his family's going through, and they obviously care and love him enough to get him the best of care." As game time drew near, Henry strode to near the pitcher's mound and commandeered a microphone. "She has shown all of us what absolute commitment is all about," he told the crowd about Brenda, "and what fierce determination is all about, and what abundant love can do for people, and you see that in her son." As Brenda walked across the field, the fans' ovation in the air, a large, dark blue van pulled up beside the Pilots' dugout. As Brenda addressed the crowd, many people got out the side and back of the van, and appeared to be surrounding something... or was it a someone? "The Pilots have been holding this night for several years now," Brenda said, "and I cannot begin to tell you what it means to Kevin and myself. This night has taught us about hope, about life, courage, and empathy. This team has meant so much to Kevin, and become such a part of who he is, and I hope that Kevin has left an indelible mark on all of you." Other members of the Eadie family - biological or otherwise - were introduced. Kevin's grandmother, nurse, and physical therapist came to the middle of the field. But still, no Kevin. Across the stands, people glanced around, looking through the bleachers, across the field, even over at the parking lot, hoping to get at least one more look at a mascot who stood for so much more than baseball. Then, the huddle near the van unfurled. The small crowd parted, and out rolled a wheelchair - and the night's main attraction. Fans leaped to their feet, and filled the nights with applause and chants of "Kevin Eadie!" The Pilots stood next to their dugout and whooped and hollered for their old friend. As a nurse gently pushed Kevin's chair toward the rest of the crowd, Kevin stared straight ahead. He couldn't wave back at the crowd, or even give them a grin of appreciation. But somehow, Brenda knew that somewhere, not very deep inside, he was loving every minute. "He's really been through a lot, and he's lost a lot," she said. "A lot of people think that Kevin is so weak, that he's just a shell, but he really isn't. He's in there. He still loves baseball, and he's fought so hard. He's just been heroic. He's trapped in a body that just won't cooperate. If you're around Kevin for a little bit, he'll warm your heart, because you know that he's there." 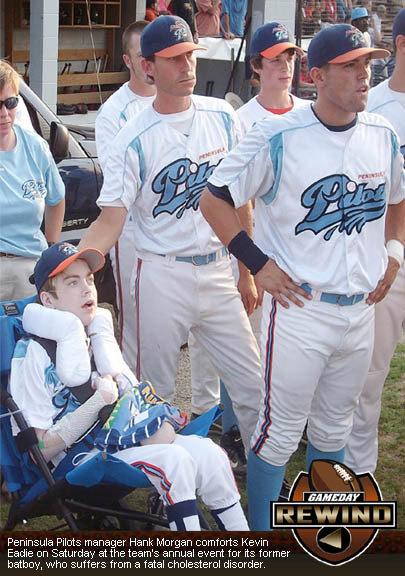 Kevin was wheeled toward the dugout to sit near the Pilots for the national anthem, then spent the first few innings inside the small building with his old squad. As the night went on, love and support in every form poured in from the crowd. Proceeds from the ticket sales were collected. Donations were raised from the audience from team representatives walking through the stands. Raffles were held. A local massage company collected its own donations behind the third-base fence. Up the road from War Memorial, the Langley Speedway racetrack held its own benefit for Kevin, and raised over $1,000. By night's end, over $10,000 had been collected to help Kevin fight his battle. Throughout the game, videos showing Kevin's life were played on the scoreboard between innings. Clips of him as a baby, before anyone could have known what was wrong, were shown. His appearances on the local newscasts were put out to watch. Even a tape of his race with Bolton was shown. Of course, there was a game to play - and the Pilots held up their end of the inspirational bargain, holding off the Generals 5-2. "You really thank God to be in the position you're in, to just be able to wake up in the morning and do the simple things," said Matt Little, who pitched seven scoreless innings in the win. "It shows how much his family loves him, and how much he loves the game. It was nice to get the win for him." But even when the game ended, Kevin's night wasn't over. As fireworks filled the sky and Bolton's song Go The Distance came over the public address system, Kevin's wheelchair was rolled to home plate. The team's current batboys rolled him to first base, where Erdman was waiting. The assistant coach guided Kevin to second, and former Pilot Jimmy Miles, who set a team record in stolen bases during Kevin's batboy days, pushed him to third. That's where the entire team was waiting, and Henry took over. As Bolton's song ended, Sarah McLachlan's Angel escorted Kevin toward home plate. As Henry rolled Kevin down the third-base line, the team crowded around the youngster, clapping and shouting encouragement. For one moment, the roles of player and fan had been reversed. The field that helped legendary catcher Johnny Bench get his start on the road to Cooperstown and the dugouts from which longtime major league manager Lou Pinella had once peered were now dominated by a young role model who was fighting an opponent greater than any divisional playoff. That's when Kevin did something that Henry hadn't seen him do since a similar outing last year at Washington, D.C.'s RFK Stadium: he lifted his leg and shook it around. It's the only way he has left to communicate. What did he mean? What was he saying? No one knew - but everyone hoped it meant that he knew what was happening, and that he knew how much he meant. No one knew how many tomorrows Kevin had left - but everyone had this one special moment that no one wanted to end. Brenda stood at home plate, clapping, tears somehow finding a way through her clenched eyes. "It is an absolute miracle that this child is here today, because there were many days, very recently, that I didn't know if Kevin was going to be here tonight," she said. "I know Kevin has continued to progress in his illness; each year, he's lost more ground. But this is very heart-wrenching and heartwarming at the same time, because I know how much he loves this team, and how much they have embraced him. He's always loved life; he's always touched a lot of lives. It's really made a difference to him, and to a lot of people that have crossed his path."